When you visit Malaysia, this is one of Things To Do In Kuala Lumpur that you must do! Take a trip to the busy and exciting Petaling Street. That was exactly what we did. After the tour of Central Market, we hopped over to Petaling Street. It was just a short distance away. Only about 5 to 10 minutes walk from Central Market. Tip: There is a video of Petaling Street below. Watch It! Don’t Miss It! Petaling Street is also known as the Chinatown in Kuala Lumpur. It has a long history in this city. The name is also Jalan Petaling in Malay, 茨厂街 (Cíchǎng Jiē) in Mandarin or Chee Cheong Kai in Cantonese. Whichever name you call it, it is a vibrant venue. It is always crowded with locals and tourists. And busy during day or night. It is also widely known as Bargain Hunters’ Paradise. And that is no surprise. There are rows and rows of stalls selling almost anything a person is seeking. Things such as clothes, souvenirs, electronics, gadgets, and more. Tip: Be careful of imitation goods. Most of the brand products sold here are not the real thing. As with most street markets, you will find much haggling happening. In fact, it is almost expected. Tip: Haggle. Bargain. Don’t take the first offer as fixed price. Petaling Street is also a food haven. There are dozens of restaurants and food stalls that serve popular dishes like Hokkien mee, Ikan Bakar, and more. More of a couple of these food stalls after the video. Tip: Visit Petaling Street with an empty stomach. 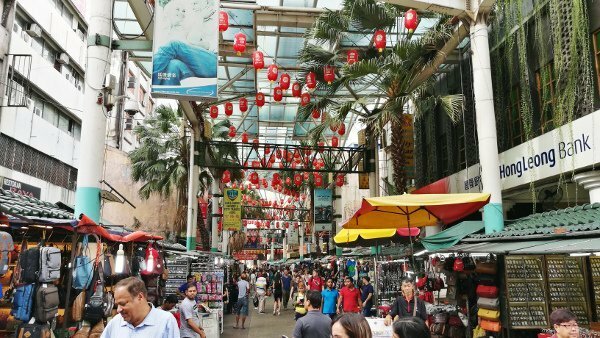 Take a look at Petaling Street and what this awesome place holds for you. I took the video during the day when it was less crowded. Tip: Visit Petaling Street during the night too! When you are at Petaling Street, you must have a cup of the famous and popular drink. It is called Air Mata Kucing. The word – Mata Kucing – is Malay for Longan. I have had many such drinks in the past. And thought this is going to be an overrated one. To my pleasant surprise, I was wrong! It was very different from any other Air Mata Kucing I have tasted before. There is no other way to say it except that you must be there to try this! This stall is now an institution. It sells only one product. And that is the drink that is made from dried longan, luo han guo (a fruit that cools the body) and winter melon. The fruits and herb are boiled and sweetened with rock sugar. The combination is cooling and refreshing. You can have it served hot or cold. This herbal drink cools the body and quenches your thirst. 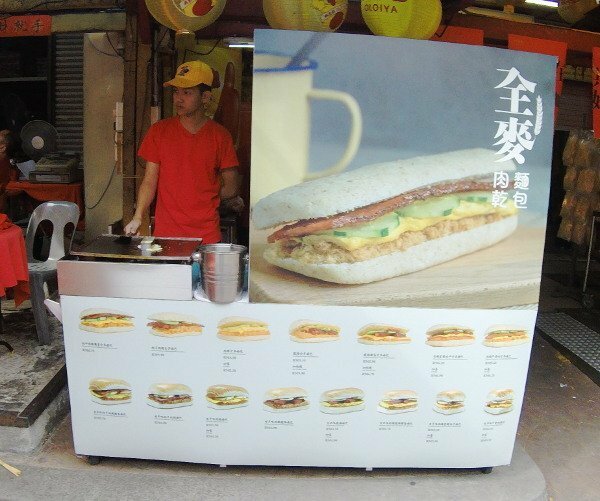 It is no wonder this stall won the Ctrip Gourmet List, Local Favorite Award in 2017! Watch this video of the award-winning stall. Tip: So thirst quenching. Buy one cup. Walk around. Go back and buy a second or third cup. Where is Air Mata Kucing stall? The stall is very easy to find. It is at the centre of Petaling Street, at the intersection of Petaling Street and Jalan Hang Lekir. On a hot day, look for a stall with a long queue of thirsty locals and tourists. There are so many really good stalls and restaurants serving great and delicious food at Petaling Street. But I cannot mention them all this time round. Maybe in the future? For now, I would like to share about Oloiya. In the past, when I traveled for business, Oloiya caught my eye. I tried their barbecued meats, and am a fan ever since. This is a popular brand. They sell barbecued meats. And opened their first shop in 1970. 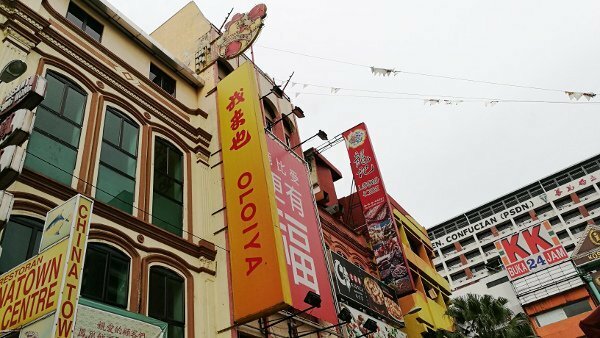 Today, there are Oloiya branches everywhere, including the one at Petaling Street. During this trip, I spotted their shop at Petaling Street. And was pleased that they now have a counter outside that cooks and sells sandwiches with their barbecued meats. Naturally, I had to have one. And the barbecued meat was as delicious as I remembered. 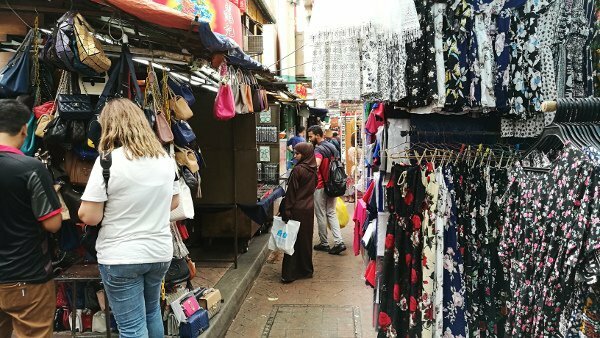 Where is Petaling Street in Kuala Lumpur? It is located opposite Kotaraya Shopping Complex and short distance from Central Market. Light Rapid Transit (LRT) – Stop at the Pasar Seni Station that is located opposite The Central Market, via the Putra Line. Short walk from the station to Petaling Street. Public Buses – There are public buses to Petaling Street. Take bus lines KL01, SPG01, and SPG02. You can ask the bus driver to help and inform you when the bus reaches Petaling Street. KL Hop-On Hop-Off – A City Tour Bus that stops at the station just opposite The Central Market. From there, you can walk over to Petaling Street. GoKL – This is a Free City Bus Service for visitors. It travels on selected routes in the city. Take the Purple route to Pasar Seni stop. From there, you can walk over to Petaling Street. This is also an option. And always take those that go by the meter. You can reject if they do not use the meter. Speak to the driver and agree to go by meter before you get on the taxi. This is my preferred option. It is so easy to travel around in cities now because of Grab. Just download the app, state your destination, a driver is assigned to you, take the transport, and you arrive at your destination. Comfortable and easy. 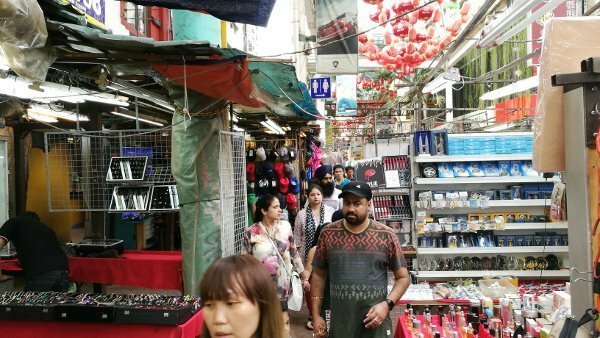 If you have ANY questions about this article, about Things To Do In Kuala Lumpur – Petaling Street, ANY at all, please submit your questions as comments below. I will be happy to help you out. Before our visit to Thean Hou Temple, we actually made a stop at the well known Central Market. This is Kuala Lumpur’s most familiar landmark. It is a centre for Malaysian culture, arts and craft. As such it is definitely one of the Things To Do In Kuala Lumpur. Tip: There is a video of Central Market below. Watch It! Don’t Miss It! The Central Market is located at the heart of the city. It is just a short walk away, about 5 to 10 minutes, from Petaling Street. 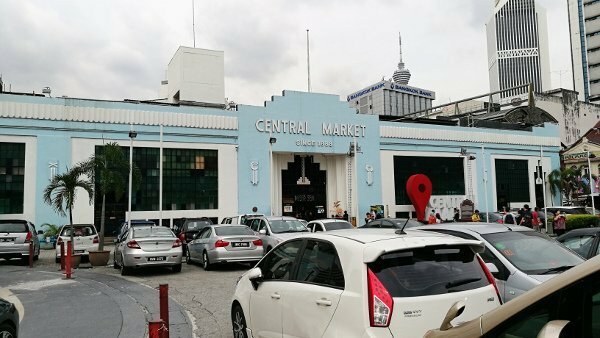 It was originally a wet market called Pasar Seni that was built in 1888. Now, it has been classified as a Heritage Site by the National Heritage Department. Today, it is a popular destination for art lovers, shoppers and tourists. At once, as you approach the building, you can appreciate the stunning art-deco structure with influences of beautiful Malaysia architecture. Inside is where you will get a real visual treat. Take your time to immerse in the sights of the Malaysian heritage. 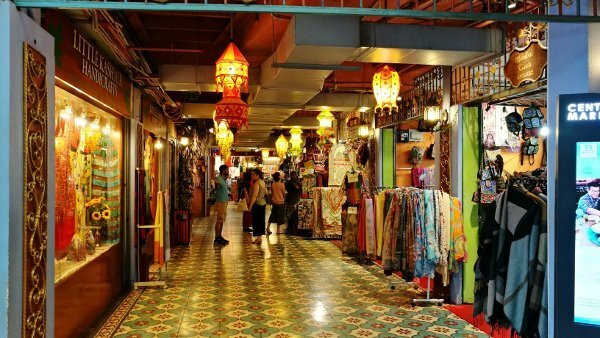 Throughout the place, there are more than 300 shops selling textiles, handicrafts, souvenirs, collectibles and authentic Malaysian batik prints. And let us not forget the delicious local food offered at the cafes, food court, food stalls, and restaurants. Central Market truly surprised me. It has changed so much. There is so much more to this place now. I must confess that I did not take as much footage as I would like to. Maybe I will take more when I visit Kuala Lumpur next time. And update this video then. Meanwhile, there is enough for you to see what Central Market is about, what you can expect to see there, and how beautiful the place and what it offers is now. Don’t miss watching this video! There is the Central Market Annexe that is located behind the main building, and offers a wide and diverse range of art galleries. Some of the attractions here are an Illusion 3D Art Museum, Art House Gallery, and the Central Market Art Lane. Don’t miss the art corner where you can find unique art studios. These studios feature the works of art by local artists. So if you are on the lookout for local art, this is a good place to find it. And of course there is the charming DIY batik workshops. Create your own batik that will have special meaning for you. Somewhere in Central Market, I chanced upon this unique find! See the image below. 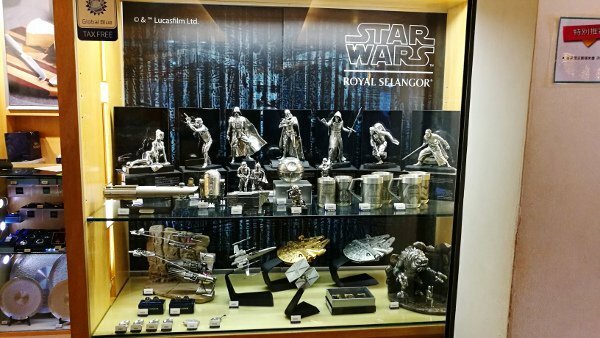 It is a collection of Star Wars memorabilia created by Royal Selangor. How unique and awesome is that??! Take one of the exits to the Kasturi Walk. This is quite a cool place that is alongside the main building. It is a walkway that has been newly transformed into an open air market. The walkway is covered, and was opened in 2011. This new ‘wing’ has an al fresco ambiance and features an exciting variety of stalls selling tantalizing local snacks and exquisite souvenirs. 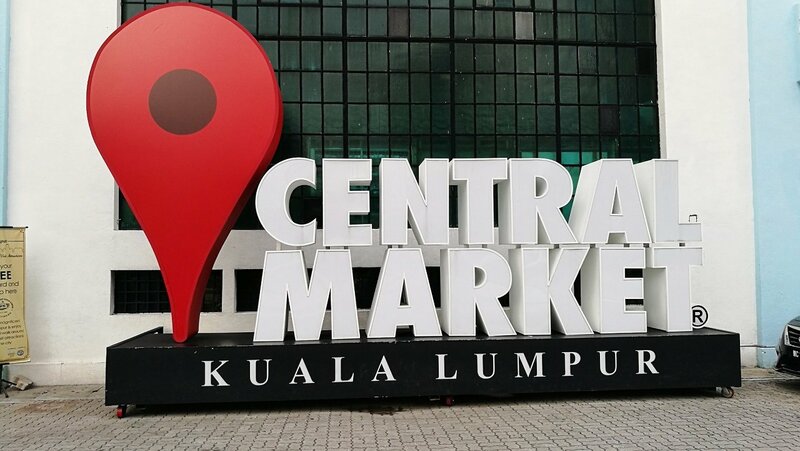 Where is Central Market in Kuala Lumpur? 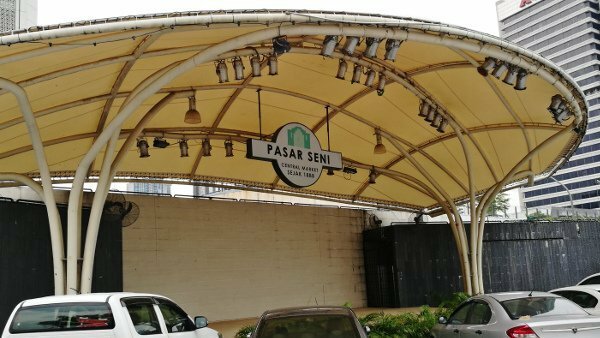 Kelana Jaya Line & MRT Line – Stop at the Pasar Seni Station that is located opposite The Central Market. Ampang Line – Stop at Masjid Jamek Station, and walk to The Central Market. About 15 minutes walk. KTM Commuter – Stop at Kuala Lumpur Station, and walk to The Central Market. About 5 minutes walk. 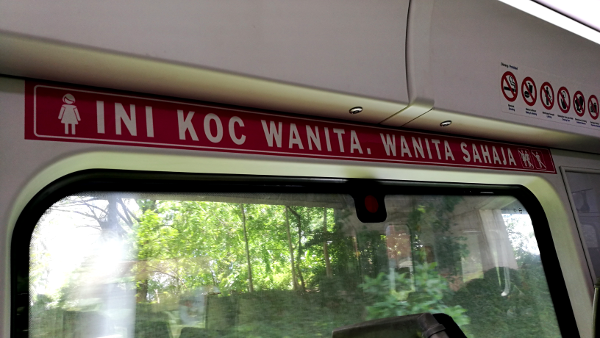 GoKL – This is a Free City Bus Service for visitors. It travels on selected routes in the city. Take the Purple route to Pasar Seni stop. From there, you can walk over to the Central Market. 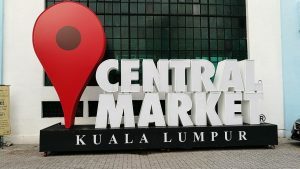 If you have ANY questions about this article, about Things To Do In Kuala Lumpur – Central Market, ANY at all, please submit your questions as comments below. I will be happy to help you out. I have always loved visiting religious sites such as temples. So, when my friend from Kuala Lumpur suggested visiting Thean Hou Temple, I was very happy. This is definitely one of the Things To Do In Kuala Lumpur. My friend picked me up from the hotel where I stayed at – Ramada Suites Kuala Lumpur City Centre. And it was a short drive, about 20 to 30 minutes to the temple. 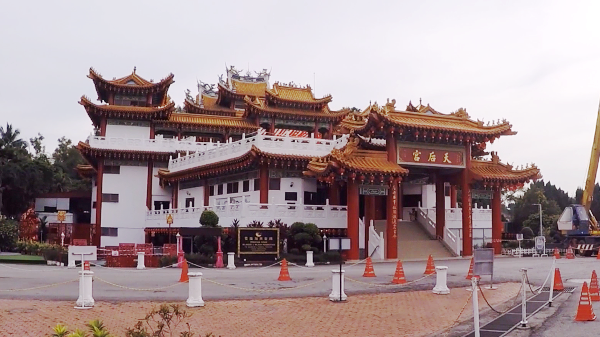 Thean Hou Temple is one of the oldest and biggest temples in Kuala Lumpur, maybe even in Southeast Asia. The temple has six tiers. The architecture has influences from Buddhism, Taoism and Confucianism. And it was built in honour of the Goddess Queen of Heaven – also known as Thean Hou or Tian Hou. Thean Hou is a Goddess to protect fishermen. Of course, the Goddess helps anyone, too. Which is why many come to worship Thean Hou and Kwan Yin, the Goddess of Mercy here. The temple was built by Kuala Lumpur’s Hainanese community. It was officially opened on 3 September 1989. It is located on top of Robson Hill, and from certain locations of the temple, you can see wonderful views of the capital of Malaysia. Thean Hou temple is so very beautiful and magnificent. The bright and colorful lanterns at the courtyard. The garden at the temple grounds. The impressive Main Prayer Hall and all the grand furnishings as well as the golden statues. All of it was quite a sight to behold. 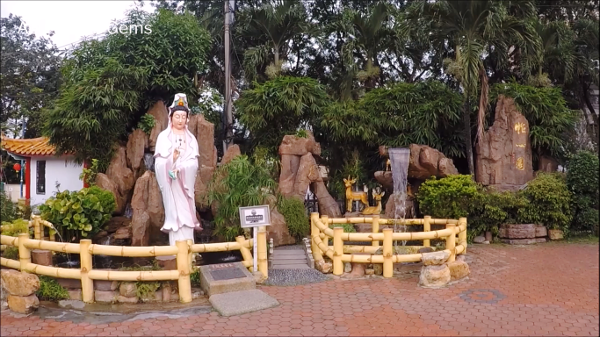 At the entrance of the temple grounds, there is a garden where you can find the fountain of Kwan Yin, the Goddess of Mercy. Here, you can stand at a fake rock in front of the statue of Goddess of Mercy, and water will spout further towards you. The idea is to cup your hands and be able to catch some of the water. Splash the water on your face to receive blessings from Kwan Yin. As you walk closer to the temple, you can spot another garden just next to the temple. This garden features the 12 animals of the Chinese Zodiac signs. At front entrance of the temple, you can begin to notice the multi-arched gateways with red pillars. These symbolize prosperity and good fortune. The columns are dragon-inspired, and there are pagoda rooftops. The rows of pretty lanterns was breathtaking. You must be there to experience this! Oh wait, watch the video I made for you (above), and it is the next best thing. It is really quite a sight! The Main Prayer Hall is on the fourth level. It is filled with bright golden statues, which the main one is that of Thean Hou Goddess. I must say, when I was there, I was very impressed with the grandeur and beauty of this hall. On the first level, there are souvenir stalls, a canteen as well as a marriage registration office. Thean Hou temple is also a popular venue for weddings. The second level is the multi-purpose hall, and the third level is where the offices are. 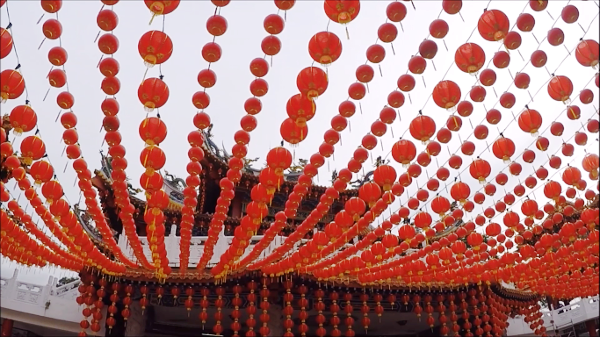 On special occasions such Chinese New Year Wesak Day, Mooncake Festivals, or the birthdays of Buddha or Bodhisatvas, you will see thousands of devotees and visitors fill this temple. They come to burn joss sticks, kneel in prayer and give offerings to the Thean Hou and all the other Divine Beings. On weekends, you can see people exercising and practising martial arts such as Qigong, Taichi, Wushu. Where is Thean Hou Temple? There are no buses or trains direct to the temple. One of the options is to go to the Klang bus terminal, and take the minibus number 27 to Jalan Syed Putra. Alight and take a short walk to the temple. The best mode of travel, that I highly recommend, is to go by taxi or Grab. To save costs, first travel by KTM to the Mid Valley station. Or you can take the LRT to Bangsar station. From these places, you can get a cab or Grab. The distance to the temple is only 2 to 3 kilometres. Also, there is less chances of you getting lost. Going out of the place and back to the city, again you can call a cab or Grab. If you have ANY questions about this article, about Things To Do In Kuala Lumpur – Thean Hou Temple, ANY at all, please submit your questions as comments below. I will be happy to help you out. Batu Caves is amazing! It is definitely one of the Things To Do In Kuala Lumpur! A natural wonder and such an work of art by the lovely Mother Earth. The large stalactites and stalagmites are truly breath taking. Some even form shapes that looked strangely familiar. It is no wonder it has become one of the icons of Malaysia, and a popular tourist attraction. We arrived in Kuala Lumpur by Aeroline bus that took us about 6 hours. It was a very comfortable ride. Upon arriving at Kuala Lumpur, we visited the Petronas Twin Towers. It was a magnificent sight to behold! And to top it off, we were delighted to find The Suites Hotel, where we stayed, an absolute pleasure. The next day, according to our plans, we made the trip to the famous Batu Caves. 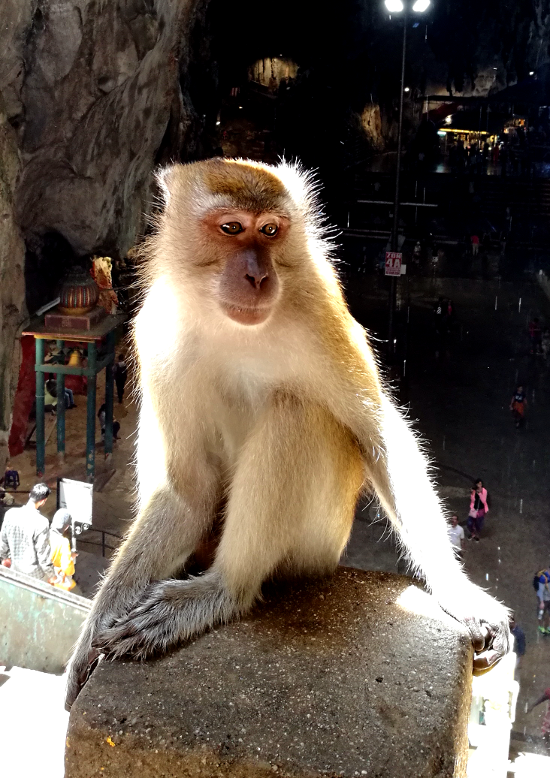 Below is the video we took of our Batu Caves experience. There are many ways of Getting To Batu Caves, and we chose to go there by train. It turned out to be a comfortable ride, economical, and only took us around 80 minutes. We shot a video about Getting To Batu Caves. To see photos & videos to show you how to get to Batu Caves, Click Here. There are many limestone hills, said to be around 400 million years old, in Selangor. And Batu Caves is one of them. What makes it unique is that it is the limestone hill that has many naturally formed caves, and temples have been built in some of these caves. The largest of these caves, and the most well known, is the Temple Cave. The name is derived from the fact that the cave houses many Hindu shrines within its majestic high ceiling limestone caverns. Tip: Every cave has a different admission price. Please note that the Temple Cave is Free to enter. And opening hours may vary for each cave. In the video, you can see a long flight of steps to the entrance of the Temple Cave. Originally, back in 1920, the steps were made of wood. Today, the steps have been rebuilt with concrete. And the number of steps? 272! Yes, you read it right. 272 steps that will test your fitness to the limits. Many people stop along the way to catch their breath. You can see it in the video too. But it is all worth it! When you arrive at the destination, you get a visual treat of awe-inspiring natural caverns that you will remember for a lifetime. I know I sure did. Tip: Near the Temple Cave is the Dark Cave. There is a mini exhibition area that provides you information about the natural history of the entire area. And if you dare, you can explore the Dark Cave with a tour (for a reasonable price). You can’t miss it. It is the huge statue at the bottom of the steps that leads to the Temple Cave. And it is in Gold! It is the Lord Murugan Statue. This is the tallest statue of a Hindu god in Malaysia. In the world, it is the second tallest statue of a Hindu god. Its height is 42.7 metres, which is 140 feet. The tall image took 3 years to build, and was unveiled in January 2006 during the Thaipusam festival then. Deep at the heart of the Temple Cave, 100m above ground, is the murti (consecrated statue) of Sri Murugan Swami. It was placed there by an Indian trader by the name of K. Thamboosamy Pillai in 1890. 2 years later, in 1892, the annual Hindu festival – Thaipusam – was celebrated there. And has been ever since. Thaipusam is a three-day festival that is held around late January or early February. Hundreds of thousands of pilgrims converge to pay homage to Lord Murugan during this time. Today, the cave and the temple combine to be one of the most popular Hindhu shrines outside of India. In the vast network of the caves, there are numerous natural inhabitants such as spiders, bats, snakes, and most visibly – Monkeys. The monkeys are almost everywhere; as you climb the heart stress tester steps, and as you visit the shrine deep inside the Temple Cave. You can see them getting food and drinks from visitors. Tip: Beware of the Monkeys! I have seen a packet of drink snatched from a visitor by a monkey. And I have heard of phones, bags, wallets, purses and more being taken away very quickly by the fast moving monkeys. So do keep your valuables close to you! Besides the monkeys, there are lots of creatures living in the caves. Of course there will be right? This is their natural home. Visit the Dark Cave to see a mini exhibit where you can see photos of the natural history of this site as well as of these intriguing creatures. Do visit the Batu Caves! They are truly amazing and one of the Things To Do In Kuala Lumpur. 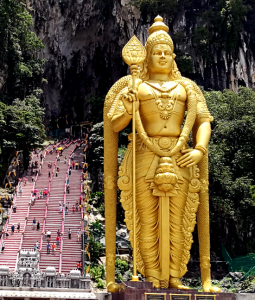 If you have ANY questions about this review, about Things To Do In Kuala Lumpur – Batu Caves, ANY at all, please submit your questions as comments below. I will be happy to help you out. There are many ways of Getting To Batu Caves, which is one of the Things To Do In Kuala Lumpur. You can get there by car, taxi, bus or via train. We traveled from KLCC to Batu Caves using the train system in Kuala Lumpur. Batu Caves is one of the icons of Malaysia and a very popular tourist attraction. You can read more about it in our blog post – Batu Caves. Let’s start the journey, shall we? We began by taking the LRT from KLCC station that was at Petronas Twin Towers / Suria KLCC to KL Sentral station. Then switched to KTM Komuter line (the blue line) to travel from KL Sentral station to Batu Caves station. In all it took us about 80 minutes because there was some time taken to find the entrances to the right lines, locate the ticket counter, understand how to pay for the tickets, etc. If you are familiar with all that, the trip should be shorter, about 60 minutes. Along the entire route, we took photos and videos. 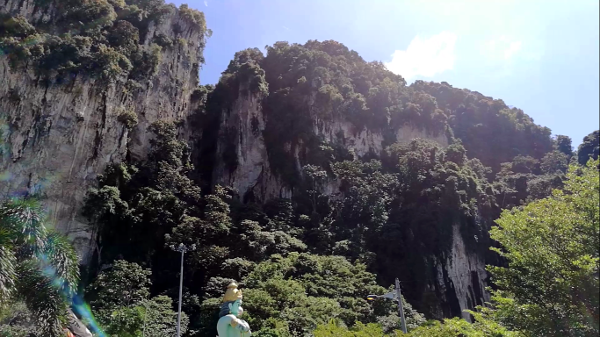 Watch the video below to see how we traveled to Batu Caves from KLCC. Remember to turn on the subtitles for more detailed information. 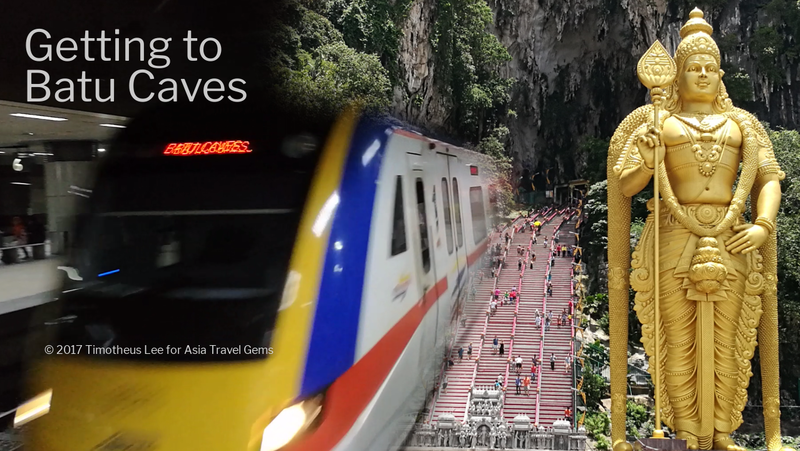 The Malaysian train system is quite efficient and can get you to many places of interest around Kuala Lumpur as well as from Kuala Lumpur to well known sites such as Batu Caves. We started at the KLCC station. Some parts of the train line is above ground, and some are under ground. The route from KLCC station to KL Sentral station is underground. As such, we took the escalator down and walked along a pathway to the station control area. Tip: Make sure you are at the right station. See the station name. In this case it is KJ10 KLCC. There was a map of the train system next to the ticketing machines. Locate that map to see how to travel from one station to another. 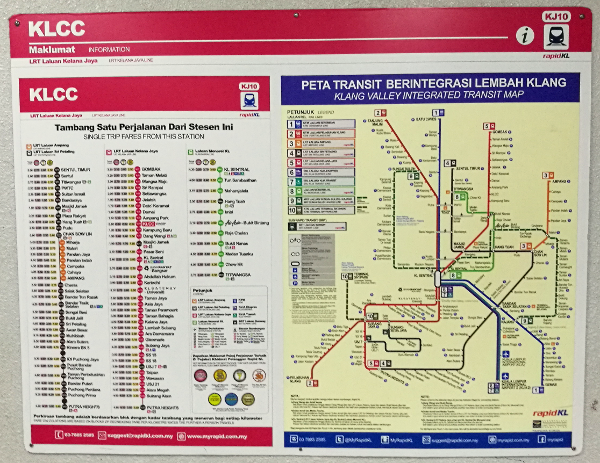 We found out that KJ10 KLCC station was along the LRT Laluan Kelana Jaya line (Line 5, the red line). To go to Batu Caves, we needed to go to KL Sentral station, and switch to the blue line that was the KTM Komuter line. That train would take us all the way to Batu Caves station, which was the last stop for that line. With that planned route in mind, we headed to the ticketing machines that were nearby. These machines are for commuters to buy tickets for travel from one station to another. Do note that Only Cash is accepted, there is no credit card or any other form of card payment for the tickets. Tip: Some ticketing machines only accept coins and MYR$1 and MYR$5. Get ready some small change! And we are not mentioning the cost of the tickets because costs can change over time. Buying the tickets was relatively easy. You just have to click on your choice of destination. In the next screen, you make sure you have chosen the correct destination, and select the number of tickets you require. If you need more, simply click on the ‘+’ button. The total amount to be paid is displayed. Insert the cash (in notes or coins) into the respective slots. The tickets (in this case they were blue round chips) will drop out into the collection area. And you collect your tickets, and change, if any. We used the tickets at the turnstiles, and entered the station. Then we got down to the platform using the escalator. And when the train arrived, we boarded the train. Tip: Make sure you board the right train. Check the signages to see which side of the platform is the train to take to get to your stop. The ride from KLCC station to KL Sentral station was quite short. It only took about 12 to 14 minutes. Again, depending on when your train arrived. At KL Sentral station. we took the escalator to the ground level, and exit the station into KL Sentral, which is a huge shopping area with lots of cafes, restaurants and amenities. But there was no time to shop. We wanted to get to Batu Caves as quickly as possible as we knew there was much to see there. We looked around, and it was easy to spot the KTM Komuter ticket counter. There was a large sign hanging above the counter, and a line of people queuing to buy tickets. We bought the tickets to travel on the KTM blue line from KL Sentral station to Batu Caves station. Then we entered the station and onto the platform to wait for the train that would take us there. It was fun waiting for the train. There was a group of tourists from Japan. We knew they were Japanese because the tour guide was excitedly explaining to the group what to expect and what to do when the train arrived. Tip: Look out for the electronic sign! It will inform you if the train that is coming is going to Batu Caves or not. And an estimated time of arrival. Don’t board the wrong train. When the train stopped, there was the usual commotion and excitement as people alighted, and everyone that was waiting on the platform started to board. When we boarded the train, we found the seating style to be similar to that of Singapore’s MRT (Mass Rapid Transit). That is, the seats were aligned to the walls of the train, and passengers faced one another. But silly us! We were like the blind men who only saw parts of an elephant. As we sat, we began to look at other parts of the train in front of us and behind. And we noticed that seating on other parts of the train were different from this part of the train. There were seats that were so comfortable with high back support. And the best part was that they faced the forward motion of the train. We loved it as we could watch scenes of the city through the windows when the train started to zoom above the ground. Tip: There are designated cabins Only For Women. Do Not Sit in these cabins if you are male or couple. (see photo below) Kindly be respectful of others’ culture, please. We Arrived at Batu Caves! After about 35 to 40 minutes, we arrived at Batu Caves station! There was still a very short walk (about 5 minutes) to the actual Batu Caves. But hey, we loved how fast this trip was, and how economical too! Plus, we traveled in comfort. We had a great time at Batu Caves. Again, we took lots of photos and videos. To see them, go to our blog post titled – Batu Caves. If you have ANY questions about this article, about Things To Do In Kuala Lumpur – Getting To Batu Caves, ANY at all, please submit your questions as comments below. I will be happy to help you out. The Petronas Twin Towers in Kuala Lumpur Malaysia is a sight to behold! It is definitely a must-see on your vacation itinerary and worthy to be considered as one of the Things To Do in Kuala Lumpur. We took the luxury bus by Aeroline to Kuala Lumpur. It started at Harbour Front in Singapore, and ended outside Corus Hotel. The Petronas Twin Towers is across the road from this hotel, only about 7 to 10 minutes walk away. It looks magnificent doesn’t it? The architecture is so interesting. We love how the structure has many facets, like that of a diamond or jewel, near the top. After the morning shoot of the Twin Towers, we headed for The Face Suites Hotel Kuala Lumpur where we checked in and stayed for a few days. Also took some photos and videos of this lovely new hotel, which we will share in a future blog post. In the evening, we had a look a the popular infinity pool of the hotel. The infinity pool is popular because of the amazing view of the city and the Petronas Twin Towers as well as KL Tower. In fact, the featured video (on our home page) was one of the photos taken from the infinity pool of the hotel. Watch the video of the Infinity Pool on our review of The Face Suites Hotel, Click Here! We were hungry, and thought why not go to Suria KLCC and have dinner? At the same time, we could grab the opportunity to take photos and videos of the Twin Towers at night. The video below was taken when we were very close to the building. Just below it in fact! We started with a shot of the fountain below and slowly panned all the way up to the top where the spires are. 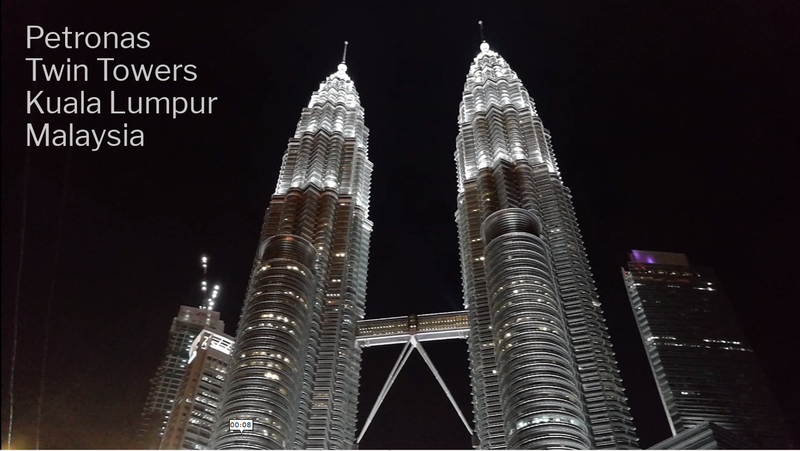 While the Petronas Twin Towers Kuala is majestic during the day, it dazzles by night. The tall building sparkles like a gem from a distance, and shines brilliantly at close quarters. There are always many people, mostly tourists, hanging around the garden and mini fountain area on the ground level, just outside the main entrance of the structure. Do not be intimidated. Just dive in and find some space to get that photo of you and the Twin Towers. Thankfully, people are generally nice, and everybody gets a chance for a photo of a lifetime. * Photo Tip 1: Get across the street to get a better shot of the Twin Towers. Some people stop at one of those islands in the middle of the high traffic roads. Be careful. Safety first. So how tall is the Petronas Twin Towers of Kuala Lumpur Malaysia? It is recorded as the tallest building in the world, that is from 1998 to 2004, according to the Council on Tall Buildings and Urban Habitat (CTBUH). At an unbelievable height of 451.9 metres, the 88-storey twin structure is deemed by many as the crown jewel of Kuala Lumpur Malaysia. It is now an icon of Malaysia, along with the nearby Kuala Lumpur Tower. 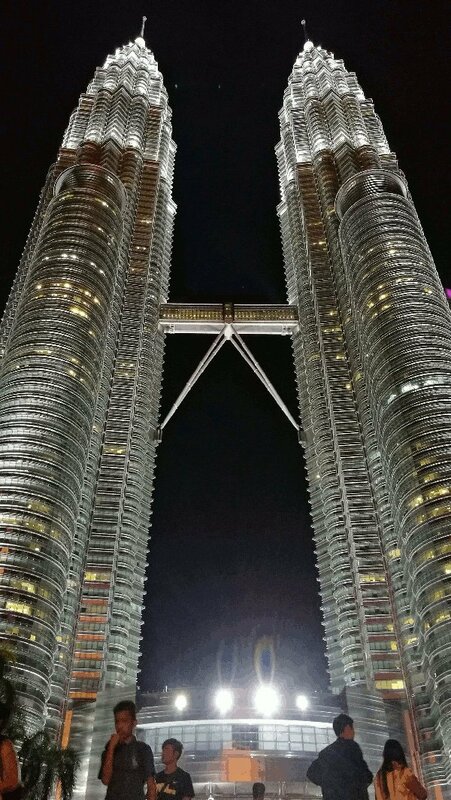 This international icon of Kuala Lumpur Malaysia was designed by Argentine architect Cesar Pelli. He chose a distinctive postmodern style to create a 21st-century icon for the city. You can visit the Petronas Twin Towers on a more personal level by taking a tour. There are interactive displays and an elevator with futuristic edge that will take you 170 metres up to the Skybridge. The Skybridge (you can see in the photos and videos of it above) connects the two towers on the 41st and 42nd floors, and is the world’s highest 2-storey bridge. The tour also takes you even higher to level 86, where you can enjoy breathtaking views of Kuala Lumpur. 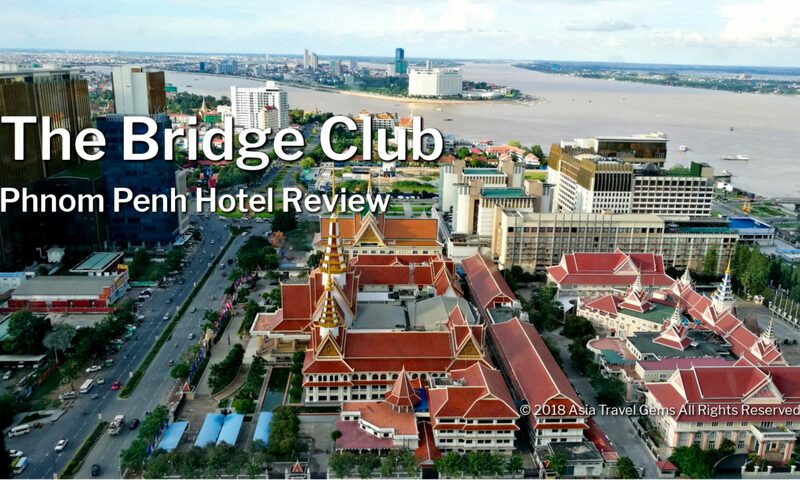 * Interesting Fact: The Skybridge is designed to slide in and out of the towers, swaying several feet towards and away from each other, to prevent it from breaking during high winds. Do note that the Skybridge is limited to 1,000 visitors per day, and you need to get a ticket to get up there. So do get your tickets early as it does get sold out quickly. Also, note that visitors are allowed to visit during specific hours, and some days access can be closed too. So do check with the ticketing counter for more details, or you can visit the Petronas Twin Towers website for more info. On the lower levels of the Petronas Twin Towers, there is Suria KLCC. This is a upmarket retail mall that spans 140,000 square meters. Tenants in the mall include luxury goods, high-street labels, food court, restaurants, cafes and many other types of tenants as well as facilities and amenities. On the first day we arrived, we were so hungry that we did not want to wait in long queues at cafes and restaurants. So we headed for the food court, and had nasi lemak (a local dish with rice flavoured with coconut, often comes with chicken wing or fish, egg and cucumber plus other optional food). Big mistake. It was not very good. On the last day, we had time, and explored a bit more. We chanced upon Madam Kwan’s. To be honest, I did hear about Madam Kwan’s before. So we tried it. And the food was very good. I will write a post about this later. As mentioned, Suria KLCC spans 140,000 square meters. So there’s a lot of shopping. And a lot to see. Inside Suria KLCC, there are also an art gallery, a philharmonic theatre, an underwater aquarium and also a Science center. 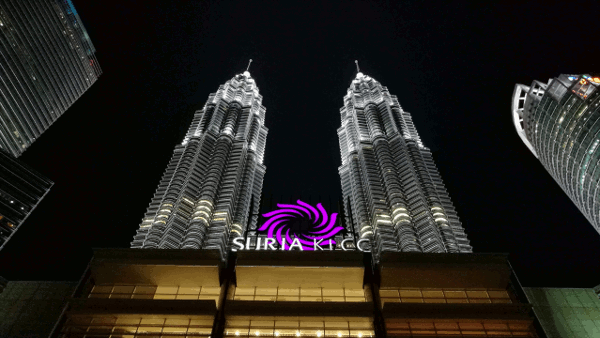 It is no wonder that Suria KLCC is considered as one of the largest shopping malls in Malaysia. We didn’t manage to experience everything because we had plans for other exciting places to visit, but some of Suria KLCC was good enough for this trip. We read about the fountain and light show that is displayed every night. Earlier during the day, just so happened when we had our lunch at the food court, we sat at a table that had a view of the park and fountain. We told ourselves that if we were around the area, and the timing was right, we would enjoy this visual and sound treat. The park and fountain area has jogging and walking paths, wading pools and a children’s playground that is ideal for daytime fun, too. The photo below was taken from the park and fountain area, at the entrance that led to Suria KLCC. Making plans to visit Kuala Lumpur? Hope this article convinces you to check out the Petronas Twin Towers and Suria KLCC? Please add a comment. We would love to hear from you now, and also if you ever visit this tourist attraction, do come back and write a comment to share with us your experience. We have also shared about Batu Caves, Madam Kwan’s, DC Comics Super Heroes Store and Cafe, The Steakhouse, and more. 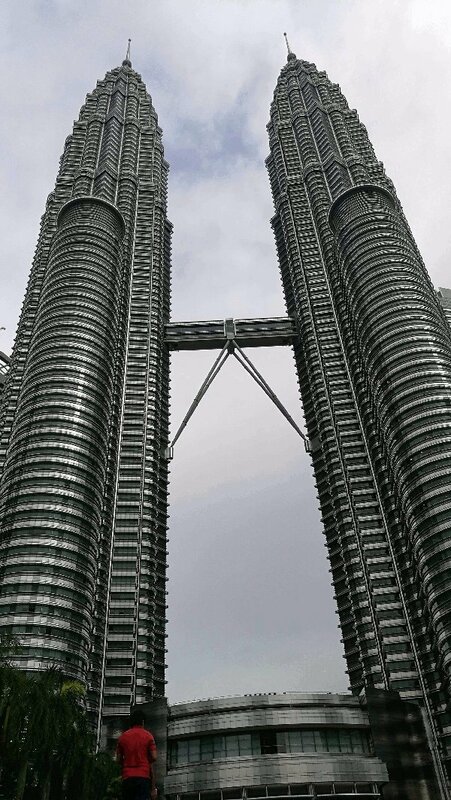 If you have ANY questions about this article, about Things To Do In Kuala Lumpur – Petronas Twin Towers Kuala Lumpur Malaysia, ANY at all, please submit your questions as comments below. I will be happy to help you out. There are many sights to see and stuff to do in the capital of Malaysia, and here are some of the Things To Do in Kuala Lumpur. This was the very first post I did of Malaysia. And of course, it must be the first post. The Petronas Twin Towers is the Icon of Malaysia. It is located at the heart of the city. Millions have visited this place, and taken selfies to remember the experience. Day and night photos and videos offer different sights. Both are equally awesome. Batu Caves – Ancient and Awesome! Everyone who visited Kuala Lumpur will eventually visit the Batu Caves. This site is famous, and very popular. The huge Lord Murugan gold statue at the entrance to the cave is sight not to be missed! The Caves itself are a testimony to the beautiful handiwork of Mother Earth. I have also created a blog post and an instructional video on Getting to Batu Caves from KLCC (Kuala Lumpur City Center). Like Batu Caves, Thean Hou Temple is another religious site. It is ornate and well decorated. Being away from the city, and high on a hill, there is a photo opportunity to capture a picturesque view of Kuala Lumpur. When is the best time to visit this temple? The Central Market used to be a boring place. 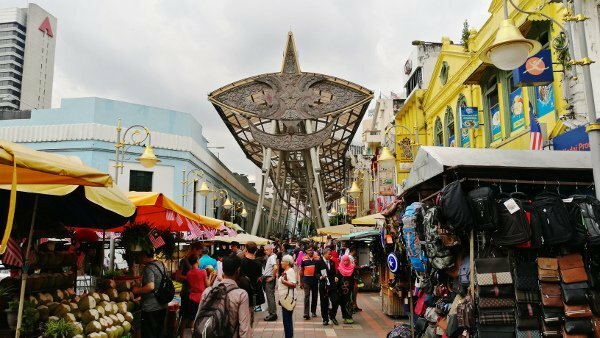 Today, it has been reinvented as an exciting and fun hub where you can learn about the cultures in Malaysia as well as shop for quality arts and crafts. I was so glad I decided to give this place a second chance. They have done a good job making this place enjoyable again. Petaling Street is a part of Chinatown. And it can be said that Petaling Street is the heart of Chinatown. It is where you can enjoy great food and shopping. Bargain hunters take note. The bargains at within certain hours. Read my travel blog to find out when. Also, there is a popular drink stall here. You must not miss trying this drink when you visit Petaling Street. It is so refreshing! And so good after hours of walking around here. If you have ANY questions about the Things To Do In Kuala Lumpur, ANY at all, please submit your questions as comments below. I will be happy to help you out.